Pisces is a 47ft crewed catamaran available for charter in the beautiful US and British Virgin Islands with her exellent crew. Life on Pisces is best lived outdoors. There is ample deck space with plenty of sun and shade areas, as well as Salon and Cockpit dining areas. She is able to accommodate six guests in three air conditioned staterooms, each with a queen bed and private en-suite bathroom. Her staterooms are tastefully decorated in soothing Caribbean colors, each with original art from local artists. Nice sized closets and cupboards allow you to unpack and make yourself at home. If you've had too much sun you can relax in the comfortable Salon, which features beautiful new cushions and throw pillows. Onboard there is Wi-Fi, a TV and DVD player plus a selection of movies, books, and games. First arriving in the Virgin Islands in the year 200, Marc fell in love with the beautiful beaches, bays and boating life; he embarked on a yearlong adventure in the Virgin Islands as an avid explorer of finding places, 'off the beaten path'. He immersed himself in the local cultures of both the US and British Virgin Islands and learned many of the unique aspects of waters in and around the Virgin Islands. Knowing he could use his findings in the future, he returned to the cold waters in the states. While Mark has been working as a charter Captain for years in the Virgin Islands, he has shared his love of sailing with other by volunteering in local youth sailing programs on both dinghies and performance monohulls in the Caribbean and in the Pacific Northwest. Marc is excited to help bring new and exciting voyages in the Caribbean to others and share his love of the islands and its wonderful sailing opportunities abord S/Y Pisces. Your First Mate, Chelsi Reed, will greet you warmly aboard the Sailing Yacht Pisces with a chilled cocktail, warmed towel and brilliant smile. She will assist you putting away your luggage before you and your group set sail into the Caribbean waters. Scott began his days on the ocean as a child learning seamanship from his grandfather and father on the shores of the Chesapeake Bay. However, it was when he began his studies at the College of William and Mary situated on the James River at the head of the Chesapeake Bay that he fell in love with sailing. Since that time, Scott has been fortunate to log thousands of miles sailing around the world including the Americas West Coast, East Coast, Great Lakes, and throughout the Caribbean and the Mediterranean, however, his true love has always been the Virgin Islands of the Caribbean. Scott’s love of the Virgin Islands can be seen in his academic work as well. He received his Masters of Liberal Arts in History from Harvard University in Cambridge where he wrote is Master’s thesis on the history of the U.S. Virgin Islands. That wealth of knowledge allows Scott to share the hidden secrets of the Virgin Islands with his clients. Prior to his life in the Caribbean, Scott was a successful executive with one of the largest technology companies in the world. In his role as Chief Revenue Officer, he helped companies worldwide in the digital transformation of their applications technology enablers. A trusted advisor for CEOs, CFOs and CIOs worldwide, Scott is a recognized expert in digital, analytics and data management, technology strategy, outsourcing and next generation application transformation to the cloud. While not sailing the SY Pisces, Scott is also an accomplished author. In the Fall of 2015, Scott's first book was published by Pearson FT Press; Inflection Point - How the Convergence of Cloud, Data, and Mobility Will Shape the Future of Business. His second book The Power of Mandate - How Visionary Leaders Keep Their Organization Focused on What Matters Most will be published in May of 2019 by McGraw-Hill. Scott has a 100gt Masters USCG Captains License, ASA 101-104 certification and his International Proficiency Certificate. Hope’s love of everything culinary can probably be traced back to the days cooking with her grandmother in Texas. Born and raised in Texas, Hope quickly learned how great food enhances everyday life. When Hope was young, she always said that she would be on a sailboat traveling the world by the time she was forty. She definitely achieved that goal. After a chance encounter at her dentist in Dallas, Hope met Scott and they have travelled the world together ever since and have some great stories to tell. They will never forget sailing through Tropical Storm Alex in the Grenadines while singing the theme song from Gilligan’s Island. Nor will they forget stern-to the quay mooring during the meltemi winds of the Greek Cyclades Islands. However, it will always be the on-going search for One Particular Harbor” that Hope and Scott will cherish. In 2014, Hope, Scott and their son Henry were featured on HGTV’s Caribbean Life as they began their search for the perfect Caribbean estate. Hope found that estate on St. Thomas and after meticulous renovation, the family opened Magens Hideaway; one of the Virgin Islands premier rental villas and bed and breakfast. 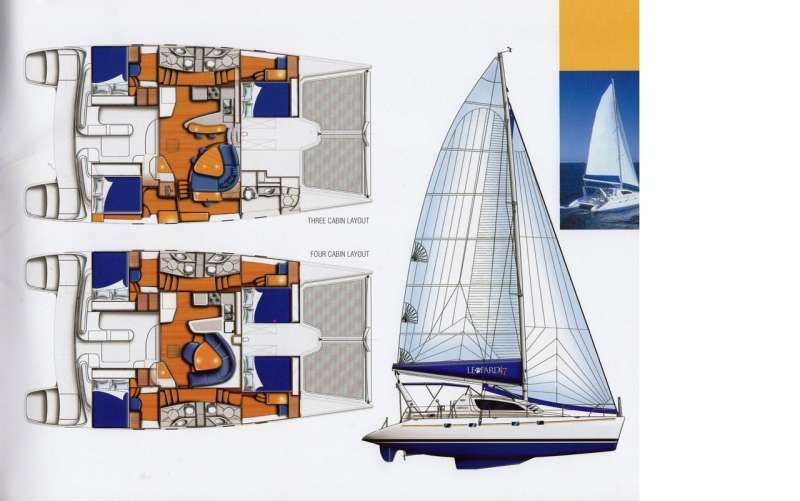 Soon after they purchased SY Pisces, a 47’ Leopard catamaran, in order to share their love of the Virgin Islands with others. Prior to her life in the Caribbean, Hope had a successful career in the culinary and hospitality industry. After running the operations for a successful high end restaurant group in the U.S., the call of the ocean lured her away. As she is heard saying, it is much more enjoyable to cook for six than six hundred. Contact us for rates and current availability or to book a charter aboard Pisces! Brendon & Anastasia were an awesome crew and we clicked immediately. The food was probably the highlight of the charter. Anastasia is an incredible chef (not just cook). She took our requests and nailed it. We saw everything we asked for and even a few new spots that were really cool. The channel beside Lovango Cay was incredible. Great breeze, awesome snorkeling. Redid our 25th anniversary wedding vows on beach at Hawksnest - complete surprise for all. Brandon and Anastasia helped coordinate flowers, video, stand-in best man.. Sailing Directions was a great liaison, worked on making it affordable, paperwork was easy and communications were great whenever I had questions either online or phone. Keep up the great work! The crew was fantastic. Brendan was very professional yet fun to be with. The food Anastasia served was first class, and she was perfect as first mate. It was an amazing vacation!! Steve was as wonderful as always and Louise was equally wonderful. Louise has really upped her game in the culinary arts - the food was good last time but really delicious and beautifully presented this trip. Pisces seemed in better shape and with a few much appreciated upgrades. Really glad I took advantage of the opportunity to dive this trip - it was magical! I had forgotten how mesmerizing it is to actually be down there, one with the fishes! Boy do I wish we had that beautiful, crystal clear water here on the South Carolina coast! We had the most amazing trip! So much so that we're all having trouble getting back into real life. We've all agreed, the trip was everything we'd hoped it would be! Great boat, superior crew, incredible snorkeling, delicious meals. All my dealings with Sailing Directions went very smoothly. Questions were answered quickly and I could not have asked for an easier booking process or better service. Thanks for everything!